Ryan Light says his Bexhill United Football Club team is undergoing the first real test of its character following a dip in form. The Pirates have lost two and drawn one of their last three games in all competitions and won just one of their last seven. “We made a conscious decision to go with youth in the side and we were delighted with the recruitment we did,” said joint manager Light. Bexhill's latest outing was a 3-1 defeat away to Storrington in Macron Store Southern Combination Football League Division One last weekend. Gordon Cuddington brought the Pirates level in the second half, but they conceded twice thereafter and Light felt they fell short of the standards they've set. Although Storrington were the better side, Bexhill carved out the better chances in the first half. Drew Greenall and Wayne Giles half-volleyed over the crossbar, while Greenall’s sweetly-struck close range effort from a Kevin Barden cross was saved by the goalkeeper’s face. Storrington took the lead shortly before half time. Away goalkeeper Dan Rose palmed a cross from the byeline into the danger area and although there were plenty of white shirts around, Storrington’s Matthew Searle drove the loose ball into the net. Bexhill levelled 10 minutes into the second half when Barden’s cross from the left was flicked past the goalkeeper by Greenall at the near post and Cuddington bundled it home. Bexhill were firmly on the front foot at that stage, but the momentum changed when Rose was penalised for carrying the ball out of his area as he kicked downfield. Rose saved the resulting free kick, but Jack Boxall tucked away the rebound. The goal rather burst Bexhill’s bubble and Storrington duly added another. With the rain now pouring down, Rose slid out to grab the ball but it popped up for Boxall to dribble into the box and shoot past the covering defenders. 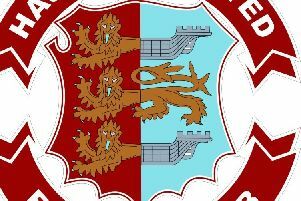 Seventh-placed Bexhill will host fifth-placed East Preston this coming Saturday (kick-off 3pm) before visiting Seaford Town in the divisional cup on Tuesday night. Drew Greenall is unavailable for both matches and Jacob Shelton (hamstring) is out for around three weeks.